Machinarium is leaving PCs so that Wii owners can take a peek into its beautiful, rusted world. Amanita Design has announced that it's teaming up with XGen Studios to bring Machinarium to the WiiWare download service. Originally released by Amanita in October 2009, Machinarium is a puzzle-adventure game with an art-style that will make you wish you could be a robot too. But no matter how hard you try, you'll never be a robot like those in Machinarium, so playing the game is as close as you'll come. It looks like XGen is giving Amanita a hand due to its experience developing WiiWare's Defend Your Castle. Machinarium doesn't have a complex interface but its puzzles sometimes require quite a bit of thought, not to mention clicking. The game's goal is for the unnamed robot protagonist to save his robot girlfriend, and later the entire mechanical city of Machinarium. Players sometimes only have to solve a single screen's worth of puzzles before leaving an area behind forever, but the game also opens up to multiple areas halfway through. 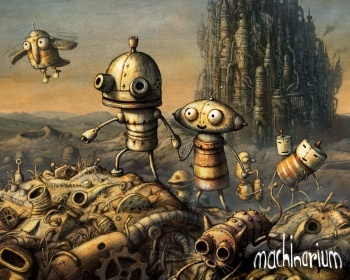 With an art style beyond comparison, Machinarium is a game any adventure fan should take a look at, and though I loved it the game might not be for everyone, which is why demos are important. Earlier this year, Amanita revealed that many had pirated Machinarium and put the game on sale to recover some of its lost funds. With the game now coming to WiiWare, it'll be a lot harder to pirate, because if you pirate a WiiWare game a Miyamoto robot flies to your house and yells at you angrily. It's quite unpleasant and not worth the trouble. No release date or pricing info for the WiiWare version of Machinarium was revealed.